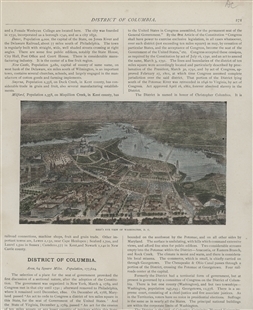 Bird's Eye View of Washington, D.C.
Cut from the pages of a book, this hand-colored photolithograph shows the prosperity of Washington during post–Civil War development. 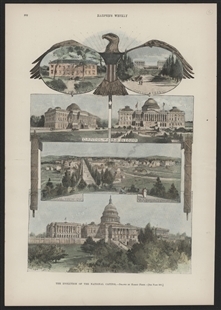 While the U.S. Capitol is the focal point, the Washington Monument, completed in 1884, is also discernible. The Potomac River is bustling with ships, but some of the bridges across it to Virginia have yet to be completed.